Abstract. Reconstructions of dust flux have been used to produce valuable global records of changes in atmospheric circulation and aridity. These studies have highlighted the importance of atmospheric dust in marine and terrestrial biogeochemistry and nutrient cycling. 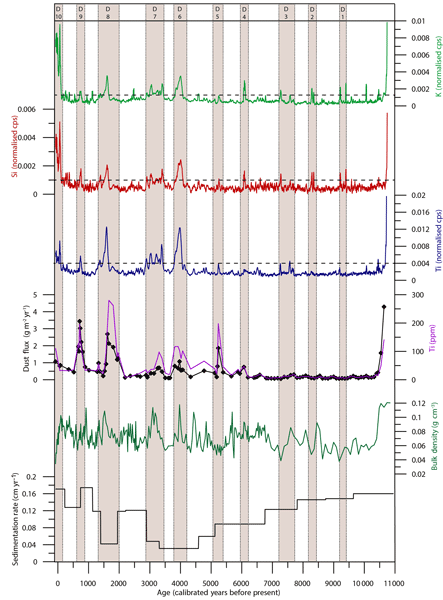 By investigating a 10800-year-long paleoclimate archive from the Eastern Carpathians (Romania) we present the first peat record of changing dust deposition over the Holocene for the Carpathian–Balkan region. Using qualitative (X-ray fluorescence (XRF) core scanning) and quantitative inductively coupled plasma optical emission spectrometer(ICP-OES) measurements of lithogenic (K, Si, Ti) elements, we identify 10 periods of major dust deposition between 9500–9200, 8400–8100, 7720–7250, 6350–5950, 5450–5050, 4130–3770, 3450–2850, 2000–1450, 800–620, and 60calyrBP to present. In addition, we used testate amoeba assemblages preserved within the peat to infer local palaeohydroclimatic conditions. Our record highlights several discrepancies between eastern and western European dust depositional records and the impact of highly complex hydrological regimes in the Carpathian region. Since 6100calyrBP, we find that the geochemical indicators of dust flux have become uncoupled from the local hydrology. This coincides with the appearance of millennial-scale cycles in the dust input and changes in geochemical composition of dust. We suggest that this is indicative of a shift in dust provenance from local–regional (likely loess-related) to distal (Saharan) sources, which coincide with the end of the African Humid Period and the onset of Saharan desertification. How to cite: Longman, J., Veres, D., Ersek, V., Salzmann, U., Hubay, K., Bormann, M., Wennrich, V., and Schäbitz, F.: Periodic input of dust over the Eastern Carpathians during the Holocene linked with Saharan desertification and human impact, Clim. Past, 13, 897-917, https://doi.org/10.5194/cp-13-897-2017, 2017. 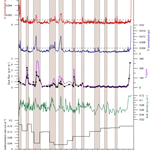 We present the first record of dust input into an eastern European bog over the past 10 800 years. We find significant changes in past dust deposition, with large inputs related to both natural and human influences. We show evidence that Saharan desertification has had a significant impact on dust deposition in eastern Europe for the past 6100 years.